This article is about the physical object. For other uses, see Bookend (disambiguation). For the Simon & Garfunkel album, see Bookends (album). For the company, see Bookstop (company). 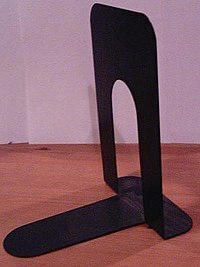 Common in libraries, bookstores, and homes, the bookend is an object tall, sturdy, and heavy enough, when placed at either end of a row of upright books, to support or buttress them. Heavy bookends—made of wood, bronze, marble, and even large geodes—have been used for centuries; the simple sheetmetal bookend (originally patented in 1877 by William Stebbins Barnard) uses the weight of the books standing on its foot to clamp the bookend's tall brace against the last book's back; in libraries, simple metal brackets are often used to support the end of a row of books. Elaborate and decorative bookends are common as elements in home decor. Bookend terrace, a bookend effect in the design of terraced houses. Look up bookend in Wiktionary, the free dictionary. Wikimedia Commons has media related to Bookends.